← Another Holiday…. and what do I do about wine???? Join us for a LIVE virtual wine tasting event with Bonny Doon Vineyard’s winemaker, Randall Grahm. In real time, taste 5 wines along side Randall and ask him your questions online. 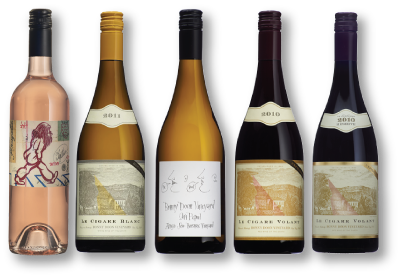 Seating is limited – call your local WineStyles to RSVP. While Bonny Doon Vineyard began with the (in retrospect) foolish attempt to replicate Burgundy in California, Randall Grahm realized early on that he would have far more success creating more distinctive and original wines working with Rhône varieties in the Central Coast of California. The key learning here (achieved somewhat accidentally but fortuitously) was that in a warm, Mediterranean climate, it is usually blended wines that are most successful. 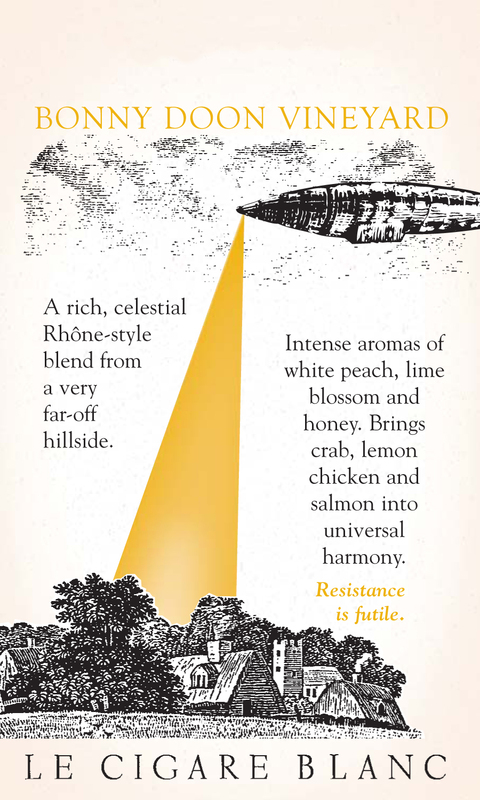 In 1986 Bonny Doon Vineyard released the inaugural vintage (1984) of Le Cigare Volant, an homage to Châteauneuf-du-Pape, and this continues as the winery’s flagship/starship brand. 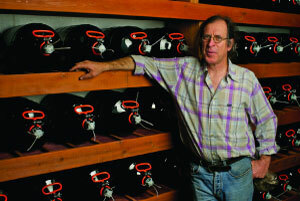 Since then, Bonny Doon Vineyard has enjoyed a long history of innovation – the first to truly popularize Rhône grapes in California, to successfully work with cryo-extraction for sundry “Vins de Glacière, the first to utilize microbullage in California, the first to popularize screwcaps for premium wines, and, quite significantly, the first to embrace true transparency in labeling with its ingredient labeling initiative. The upside of all of this activity has brought an extraordinary amount of creativity and research to the California wine scene; the doon-side, as it were, was perhaps an ever so slight inability to focus, to settle doon, if you will, into a single, coherent direction. Bonny Doon Vineyard grew and grew with some incredibly popular brands (Big House, Cardinal Zin and Pacific Rim) until it became the 28th largest winery in the United Stated. Since early 2004, Bonny Doon adopted Biodynamic viticulture and biodynamic practices in as many of their vineyards as practicable. Randall was born in Los Angeles in 1953 and attended Uncle Charlie’s Summer Camp, excuse me, the prestigious University of California at Santa Cruz where he was a permanent Liberal Arts major. Some time later he found himself working at the Wine Merchant in Beverly Hills sweeping floors. By dint of exceptionally good karma he was given the opportunity to taste an ungodly number of great French wines and this singular experience turned him into a complete and insufferable wine fanatic. He returned to the University of California at Davis to complete a degree in Plant Sciences in 1979, where owing to his single-minded obsession with Pinot Noir he was regarded as a bit of a holy terroir in the hallowed halls of the sober and sedate Department of Viticulture and Enology. In 1991 Randall was indicted into the Who’s Who of Cooking in America by Cook’s and in the same year Ted Bowell of the Lowell Observatory in northern Arizona named the “Rhoneranger” asteroid in his honor. He was proclaimed Wine and Spirits Professional of the Year by the James Beard Foundation in 1994. Randall lectures frequently to wine societies and technical groups, and occasionally contributes quixotically sincere articles to wine journals. His idiosyncratic newsletters and articles were collected, carefully redacted, and with the inclusion of some very timely new material, published as the award-winning book, “Been Doon So Long: A Randall Grahm Vinthology” in 2009. In 2010 the Culinary Institute of America inducted him into the Vintner’s Hall of Fame. He lives in Santa Cruz with his muse Chinshu, their daughter, Amélie and his thesaurus. Follow Randall’s wine blog. This entry was posted in Winery Spotlight Tastings and tagged bonny doon, Bonny Dune Vineyards, Imagine Vin Gris, La Cigare Volant, Le Cigare Blanc, Le Cigare Volant Reserve, local wine event, local wine tasting, Picpoul, randall grahm, tasting, tasting event, tasting station, virtual wine tasting, wine, wine event, wine portfolio tasting, wine styles, wine tasting, winemaker event, winemaker tasting, winery spotlight, winestyles. Bookmark the permalink.